You’ve awakened into the dream world. This is not the conceit for a new horror movie starring a ragged middle-aged Freddie Prinze Jr., it’s a standard description of the experience of a real medical condition: sleep paralysis. It’s a strange phenomenon that seems to happen to about half the population at least once. People who experience it find themselves awake in the dream world for anywhere from a few seconds to 10 minutes, often experiencing hallucinations with dark undertones. Cultures from everywhere from Newfoundland to the Caribbean to Japan have come up with spiritual explanations for the phenomenon. Now, a new article in The Psychologist suggests sleep researchers are finally figuring out the neurological basis of the condition. In other words, you experience just a piece of REM sleep. As David McCarty, a sleep researcher at Louisiana State University Health Sciences Center’s Sleep Medicine Program, explained it, humans tend to think about the elements of the different stages of sleep as packaged nicely together. So, in REM sleep, you’re unconscious, experiencing a variety of sensory experiences, and almost all of your muscles are paralyzed (that’s called atonia). “But in reality you can disassociate those elements,” McCarty said. 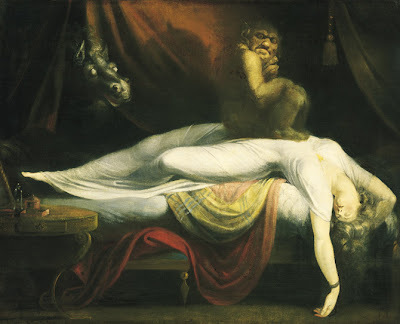 In sleep paralysis, two of the key REM sleep components are present, but you’re not unconscious. Narcolepsy, which can be linked with sleep paralysis, has a similar pathology. For narcoleptics, some of the elements of rapid eye movement can “come out of nowhere,” he McCarty said. But the condition lived in folklore long before anyone tried to subject it to even semi-rigorous study. The various responses have fascinated some researchers and they were cataloged in the 2007 book, Tall Tales About the Mind and Brain. In Japan, the problem was termed kanashibar. In Newfoundland, people called it “the old hag.” In China, “ghost oppression” was the preferred nomenclature. A study released earlier this year found that more than 90 percent of Mexican adolescents know the phrase “a dead body climbed on top of me” to describe the disorder. More than 25 percent of them had experienced it themselves. Having an element of REM sleep mix with your consciousness is scarier than it sounds. I experienced sleep paralysis on several occasions when I was in college. I can testify: It’s run-to-your-mama scary. In my case, it would happen right as I was falling asleep on the two twin beds that I had taped together. The most vivid time, I “woke up” with the uneasy feeling that something awful was to my left, on the border of my peripheral vision. I couldn’t really see it, but I knew that it was evil and coming closer to me. I felt true terror, like you experience when you are about to get in a car crash. I was sure it was going to hurt me. After a few minutes, I could finally move and took the opportunity to run across campus to a friend’s house and asked to sleep on the couch. With the lights on. It happened a few more times. Then, it just stopped. It hasn’t ever happened again. The good news, McCarty said, is that my experience is actually pretty standard. Sleep paralysis rarely persists or causes serious life damage.